What happens when you combine the most popular smart thermostat with the most popular voice assistant? You get the ecobee4 with built-in Alexa. This is the ecobee4 with Alexa. 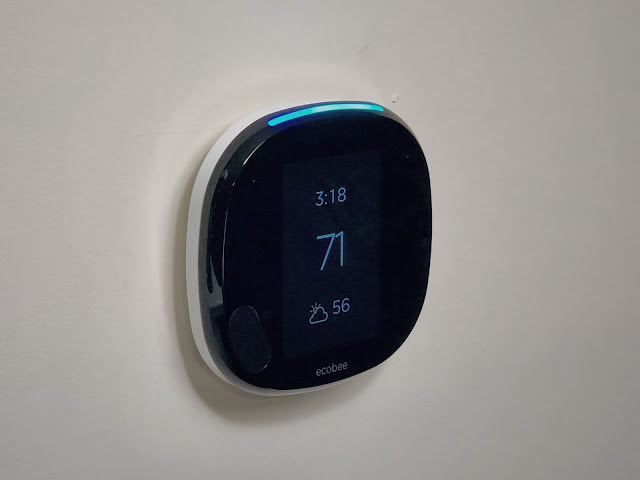 Ecobee was kind enough to send me this thermostat for review, and in this review we’ll show you what makes it the industry leader in an increasingly crowded thermostat market. I’ve had this thermostat for months and I have a lot of information to cover on why this is the best thermostat you can buy. We’ll go in depth on my favorite features in a moment, but first let’s see if the new flagship feature of the ecobee4 is any good. The ecobee4 features far field voice recognition as well as cloud based wake word verification. This means that ecobee is really good at knowing when you’re talking to it and when you’re not. The ecobee4 is one of the first mainstream devices not owned by Amazon to have Alexa built in. If you’re familiar with Amazon’s Echo this is very similar. You can ask Alexa questions, set timers, buy things, and even play music. Yes, it’s 2018 and my thermostat can stream music from the cloud. There are a handful of features that ecobee doesn’t support yet. For instance you can’t change the wake word to be something other than Alexa and ecobee currently can’t participate in whole home audio synchronization. And that’s a pretty big deal since ecobee has announced a smart light switch with Alexa that will be coming this year. Their goal is to put voice control throughout your entire house. But the good news is that through software updates these features and more will be enabled in the near future. As Amazon makes changes to Alexa those changes are first made available to their own products and then for third party products like ecobee. Ecobee has said that as soon as Amazon makes these features available they'll get right on it. For example when the ecobee4 first launched it would answer Alexa requests simultaneously with any echos in the room and many reviewers slammed it for this. But with an automatic software update it now supports Amazon’s ESP for spacial awareness and will coordinate with other Alexa devices in the room so only one answers. If you’d like some privacy you can mute the microphone on the ecobee. At first this put an unsightly red bar at the top of the thermostat that stayed on all the time. But through a software update ecobee fixed that so the red bar goes away after a short time and you only have an icon on the screen letting you know the mic is muted. It’s little changes like this that let you know ecobee is listening to customer feedback and continuing to improve their products over time. If you don’t like Alexa at all you can choose to not set it up. But ecobee doesn't currently make a model with all the flagship features that doesn't have Alexa built in since they're discontinuing the ecobee3. At the time of this review you can still find the ecobee3 at many online retailers and sometimes for a substantial discount. There’s the ecobee3 lite, but I struggle to see where that model fits in since it doesn’t have the most basic feature that you’d want in a smart thermostat which is occupancy detection. The primary reason you buy a smart thermostat is for energy savings. After all, heating and cooling your home can account for up to 50% of your energy bill. Being able to dial the temperature back a few degrees can add up to substantial savings. Ecobee does this through a feature called smart home and smart away. Thermostats have been able to follow a schedule for over a decade now and as you would expect ecobee does that really well. There’s a prebuilt template to get you started and the schedule is really easy to customize. ecobee even takes outside weather into account and can begin returning back to your home comfort setting sooner if it realizes it’s going to take longer based on the outside temperature. The schedule uses comfort profiles to set the desired temperature. The default comfort profiles are home, away, and sleep. The beauty of using a comfort profile is that if you decide that you want to alter your schedule to change the temperature for when you're asleep you can do that by changing it on one place instead of needing to make the change for each evening. Using a predefined schedule makes a lot more sense to me than using AI to guess what I want the schedule to be. The reason people traditionally haven’t set their programmable thermostats is because the interface is difficult to use and their schedules change. It’s not that we don’t know our schedule and need a thermostat to figure that out for us. But what happens when you deviate from this schedule? ecobee has a motion sensor built into the thermostat and the remote sensor. It uses this data to determine if you’re at home. If you’re normally home on Tuesday evenings but this week you went out to see a movie, ecobee will sense that no one is home and dial the thermostat back to save energy. Also if you’re normally at work during the day but stayed home today ecobee will sense that and keep your home at the normal temperature instead of going to the scheduled away mode. Most ecobee users can stop there and save hundreds of dollars a year. But if you’re like me and don’t mind some advanced configuration you can squeeze more savings out by looking at geofencing. Geofencing is the idea of putting an imaginary fence around a location and then taking action when you enter or exit that fence based on the gps of your phone. With the ecobee3 I mentioned I was using IFTTT to put my thermostat back in home mode when I was still five minutes away. This is great for helping get your home cozy before you arrive. But that’s more about comfort than savings. What about when you leave? The ecobee is super conservative here and waits for two hours of no motion before it will automatically go into smart away mode. And unfortunately you can’t adjust that timer. Also when the unit goes into smart away mode it only dials the temperature back a very small amount instead of 3-4 degrees like switching to the away comfort profile can. Leveraging geofencing can set your thermostat to away more quickly and with a larger delta to maximize savings. However, If I try to use IFTTT to put my thermostat in away mode then it will do so regardless of if my wife is still at home. That’s not going to work. At the time of the ecobee3 review I wasn’t using HomeKit outside of the home because it required an Apple TV. But with iOS 10 and now 11 a lot has changed with HomeKit. You can now use an iPad that stays at home connected to your WiFi as your HomeKit hub. So I can use Siri when I’m out and about to change my thermostat or better yet I can use HomeKit geofencing to set it. The beauty of this is that with iOS 11 Apple added the ability to take action once all members of the home exit the geofence. So now my ecobee4 with HomeKit is smart enough to know when I leave to not go into away mode if my wife is still at home. But if she leaves later in the day it will. Then when she or I return it will switch back to the home comfort setting. This is really ideal for max energy savings. But while it sounds great on paper, it’s not as reliable in reality. It seems to struggle most when we leave home at the same time. This is with iOS 11.2 so if you're reading this and iOS is later than 11.2 it's possible this has been corrected in a software update. Granted this is using an iPad as the HomeKit hub, so if you’re using an Apple TV your mileage may vary. But even when HomeKit lets me down, ecobee’s smart away mode kicks in after a couple of hours anyway. So far I haven’t told you anything that you can’t get from another smart thermostat. But ecobee’s remote sensors are what really make it unique. Each ecobee4 thermostat comes with one remote sensor. You can also buy additional sensors, up to 32 per thermostat. These sensors detect temperature and motion. They feature a little stand or can be wall mounted. Other thermostats read the temperature and detect motion only at the thermostat. There are many situations where this isn’t ideal. Let’s say you work from home and stay in your home office all morning. If you never walk in front of your thermostat it will think you’re away. But with ecobee you could put the remote sensor in your office and it would detect your motion and keep your home nice and cozy. Additionally the ecobee can be set to only consider rooms that are occupied. This feature is known as Follow Me. So in the home office example it will make sure the home office is at your desired temperature regardless of what temperature it is at the actual thermostat. The temperature of the remote sensor is what would be displayed on the ecobee’s display. A great use case I heard on this was someone who keeps their dog in an upstairs room while they’re gone to work. In the morning the sun comes in through the window and heats that room to an uncomfortable level. By putting a remote sensor in that room they were able to ensure that their pet is at a comfortable temperature. That does mean that the room where the thermostat is located will be extra cold, but this example is more about keeping your house comfortable and less about saving money. If there is motion in the other rooms, or you have follow me disabled, then ecobee with average the temperatures and act based off that value. If your thermostat is located in a less than ideal location, you can even tell the ecobee to never use its own temperature readings and do everything based on the remote sensors. As long as you have one sensor per comfort setting it doesn’t matter which sensor it is. A common misconception is that having these sensors will allow you to control which rooms you heat and cool. While there are automated vents you can buy from other companies to use with ecobee, most Hvac professionals will steer you away from that. Your system was designed to operate at a certain pressure and closing off too many vents can upset that. Instead, the remote sensors allow you to consider other locations in your home as you heat and cool the entire home instead of just getting a temperature reading from the location of the thermostat. My next favorite feature and something else that sets ecobee apart is the integration with other systems. Ecobee is by far the most open system out there. I’ve already mentioned that they support HomeKit, IFTTT, and Alexa, but they also now support google home in addition to wink, Samsung smart things, Haiku fans, Logitech Harmony, vera, and Control4. And if that isn’t enough they have an open api that if you’re so inclined, you could use to write your own app integration. Ecobee definitely takes home the award for plays well with others. Next we’ll look at all the customizations, options, and data that ecobee provides. The app for iOS and Android is full featured and will allow you to do almost everything you can do from the thermostat even when you’re not at home. It looks just like the thermostats controls which makes a lot of sense. If you want more granular customizations you’ll have to go to the thermostat itself. But for all the regular day to day controls the app is great. There’s even an Apple Watch app for basic tasks like quickly checking or changing the temperature. The app does have a few things I’d like to see improved though. For starters it’s usually a little slow when retrieving data. It starts off by showing you the readings from the last time it contacted the thermostat and then refreshes eventually. You can force a refresh by pulling down on the first page or if you’re already on the thermostat details you can go back to the main page and choose the thermostat again. If you’re using the iPad app or the web console, you can get detailed history reports for the last 15 months. None of the competition comes even close to this. I do wish they’d enable these reports on the phone as well, especially with the screen real estate of larger phones these days. These reports helped me confirm this past year that my main unit had a problem and was slowly becoming unable to cool effectively. After an Hvac service visit we discovered a slow coolant leak that matched what the ecobee history had shown. I also used these reports when I first got the ecobee3 to see that my auxiliary heat was running way too frequently. I was able to change the outside temperature settings to allow my heat pump to safely run in colder temperatures. If you're using ecobee with a heat pump I suggest you do the same. First you'll want to lower the compressor minimum outdoor temperature to a setting that's appropriate for your model heat pump. Then make sure that the unit is allowed to use the compressor and the aux heat simultaneously. Electric auxiliary heat is really expensive and making these minor tweaks will allow you to get the most out of your heat pump. This obviously varies depending on your unit, but having the visibility into what your unit is doing as well as really granular options and controls has been huge. Ecobee’s screen is large and easy to view across the room. It’s also a standard touch screen that most anyone is familiar with. The screen features a standby mode and an active mode and automatically switches when you approach the thermostat. Standby mode shows the current temperature, outside weather, the current time, and if the microphone is muted. The active screen shows the current temperature as well as the set points and humidity. There are icons at the top that show if heating or cooling is currently running, and all the menu buttons across the bottom. From here you can access the settings, check the weather, or quickly set your comfort profile. The weather information on ecobee is great and much better than the competition. You get a detailed forecast of the current day along with the next four days forecast as well. My kids frequently use this to see how to dress for the day. On screen and app based alerts are really helpful as well. Ecobee can alert you when to change your filters based on runtime. They can also let you know when your system is doing something abnormal. Like if the auxiliary heat is running for a prolonged period of time, or if the system is trying to cool but the temperature is rising. These alerts can help you discover hvac issues before they become a big problem. The installation is simple and most homeowners will be ok installing it themselves. It's worth mentioning that ecobee requires a C wire for power. If your wiring doesn't have that ecobee comes with a power extender kit that you can install at the HVAC unit to send power over the wires you do have. If that makes you uncomfortable ecobee’s support is fantastic and they'll gladly walk you through it over the phone. By using the power from your HVAC unit ecobee doesn't have to turn off the display to save battery life, and you don't have to worry about frozen pipes because your battery died during the middle of winter. The ecobee4 has all the great features we know and love from the ecobee3 as well as the best voice assistant out right now. Thanks for sticking around through this thorough review. I tried to provide all the information I'd want from a review if I was in the market for a thermostat and not just read the marketing material from the box. If there was anything I didn't cover then just leave that in the comments and I'll get back to you.